All apprentices arrive on Friday, January 4th. Registration is 2-4 pm (plus WFW starts). The 8th level work starts: January Thursday 3th, in the afternoon at 2.00 pm. The 8th level work ends on Saturday the 5th in the evening. Friday January 11th is a full training day with a smashing party in the evening. Plan to depart on Saturday, January 12th. This year the catering will be done by Corridor Catering with Suzan Kalle. She is a young entrepreneur and is passionate about food and loves cooking. She works for many years together with Roosje who catered last years Winter Training. Besides cooking Suzan runs an art space in Amsterdam with the name Corridor there is often cooking involved so she started Corridor Catering. Next to that she regularly accompanied Roosje on the road with the foodtruck, catering for film crews and Dutch movie stars. Suzan will be assisted together with a colleague to make sure all meals will be served smoothly. 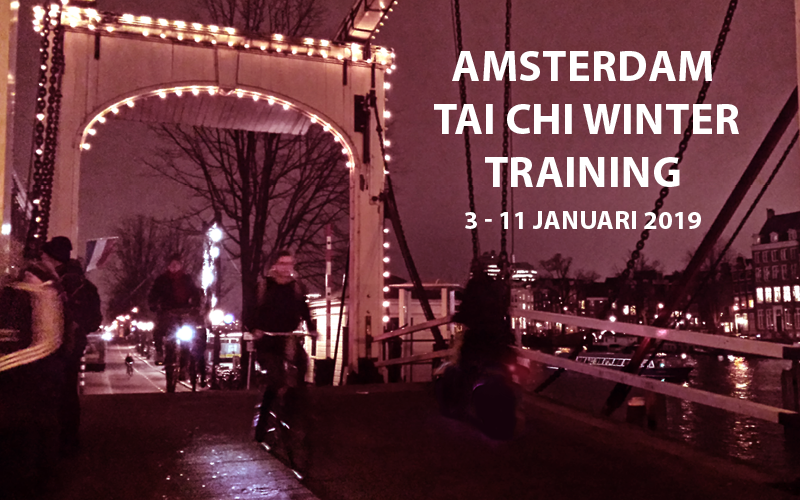 The Amsterdam Tai Chi School is at Kerkstraat 441. It is nicely located in the city in a friendly neighborhood. In between classes you can take a walk by the canals or after a nice relaxing day of Tai Chi, have a drink in one of the warm cafés. The School is easy to reach with public transport. From Schiphol Airport to Central Station it takes about 20 minutes by train. From there you can take tram 4 destination Station Rai and get off at stop Keizersgracht or Prinsengracht. Switch on Google maps and find your way to the facility. From there it’s only a 5-minute walk. Flex 427, Kerkstraat 427. Just beside the Tai Chi School. Gemeente Gods, a.k.a. the Ballroom, Nieuwe Herengracht 103. 10-15 minutes walking from the Kerkstraat. You might want to consider renting a bicycle. You are responsible for your own accommodation. Instead of booking a hotel, you can also take a look at Airbnb, www.airbnb.com. You can rent apartments all around the city through this website. Contact your Tai Chi buddies and book a nice apartment together. Last Winter Training a couple of our apprentices had a good experience dealing with Airbnb. So talk to your friends and book online. At their website you can find more information. Here is a list of hotels in the vicinity of the training location. Hotel Atlanta, 3 stars, Rembrandtplein 8 – 10, about 10-minute walk to training locations, http://www.atlantahotelamsterdam.nl. Hotel Asterisk, 2 stars, Den Texstraat 16, about 10-minute walk to teaching locations, http://www.asteriskhotel.nl/en/. Prices vary widely, depending on market conditions and the number of stars of the hotel. To get a competitive price we suggest you go to either www.booking.com and find the hotel you’re interested in. Check the price for the room you want and then, instead of booking through either of these sites, contact the hotel directly, and ask for a 10-15% discount. As all hotels have to pay around 15% commission to these booking engine company’s they will usually agree. Amsterdam also has a lot of hostels. On http://www.hostelbookers.com you can find more information and a lot of options. We find it important that all apprentices feel that they are most welcome to join the training, even if there are financial constraints. Here are three ways to help you with that. Thirdly you may want to consider the Bernie Dushman Scholarship Fund (BDSF). This Fund supports students/apprentices financially to attend a training. Scholarship Applications are available at the TCF website, www.taichifoundation.org/scholarship-information. Applications submitted well before the start of the training are more likely to result in awards given the limited amount of funds available for scholarships and the time required for application reviews. Any person who attends the WT 2019 grants permission to TCF to record his or her visual/audio images, including but not limited to, photographs, digital images, voices, sound or video recordings, audio clips, or accompanying written descriptions, and, without notifying such person, to use his or her name and such images for any purpose, including advertisements for future programmes and events. If you would prefer that your image not be used please let us know during on-site registration. Do you want to lead a Time in the Art session?